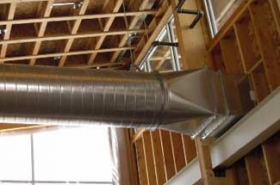 Our process begins with a duct blaster test to determine whether your building has a duct leakage problem. This is a fairly simple test that is similar in many ways to a blower door test. We reduce the air pressure within the duct system and measure the rate at which air infiltrates the ducts, enabling us to identify how "leaky" the ducts are and how much they could be improved. If our duct test determines that your home could benefit from a duct sealing and duct insulation upgrade, we begin the upgrade process. Sealing your ducts where they are most in need of sealing, we improve the efficiency with which your HVAC system distributes air throughout the home. This leads to lower energy bills, improved comfort, and improved indoor air quality. For more information about our services, or to schedule a no-obligation phone consultation, contact us today!